When we stumbled over the noisy Car release, which Holly dropped last year through the Chicago cassette label ThirdSex ,we penciled here name down on our list. When Matt from RVNG Intl. sent an email around letting everybody know that Holly had finished her album and would release it in October, we immediately contacted her—fortunately, she was still in Berlin. Electronic Beats: Around ten years ago you moved to Berlin. Looking back, was it a good time? 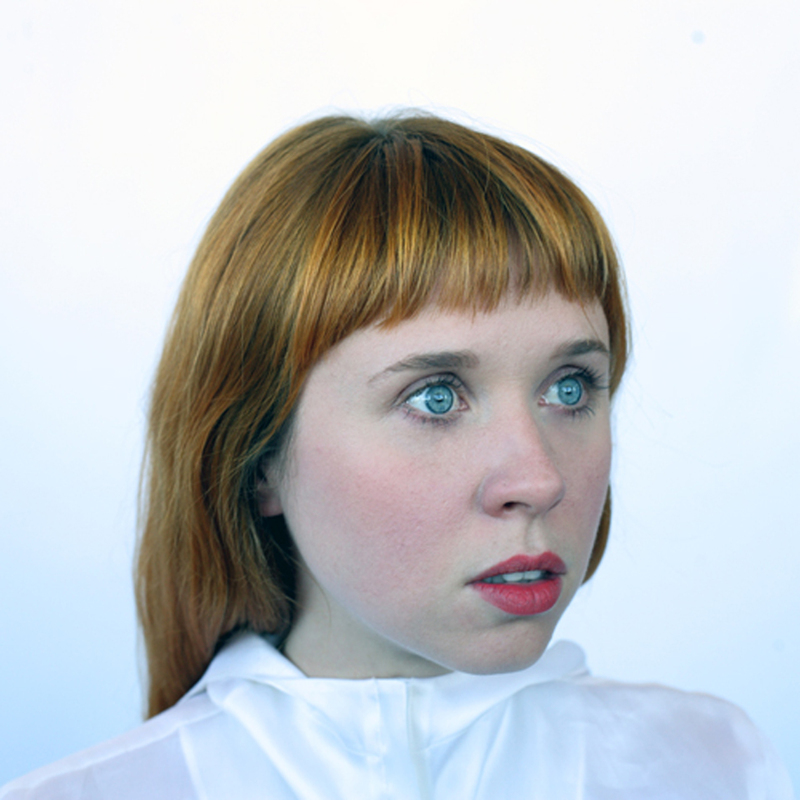 Holly Herndon: Absolutely. It definitely made a huge impression on my character. They were very developmental years, I think. Yeah, absolutely. Coming from the States – I grew up in Tennessee – electronic music there still doesn’t really exist. One thing I remember, I had this German boyfriend, and I remember going to visit his mom, and when she would take a shower she would listen to trance music in the shower. It’s just so normal here, electronic sounds are so embedded, when you go to Kaisers or something they’re playing techno or whatever [laughs]. Just having that normality when it comes to electronic music made a huge impression. You just become used to it. In the States it’s still new for people. When I first moved to Germany I walked into a supermarket I was hearing Kraftwerk, it’s like Britney Spears here, it’s everywhere. But you’d never hear Kraftwerk anywhere in a store in the US, usually. It’s funny to compare, you would never hear country music here anywhere. It’s just different forms of national expression. I think it’s starting to change somehow because so much pop music is using trance sounds, but that’s fairly recent. People still love their guitars in the United States. When you were in Berlin were you linked to any club scenes or musicians? I floated around with some different crews but I worked at Cookies for a while, the second location. Working there you become completely embedded within the scene—not only are you working there but you become friends with people who are working at other clubs, you get in free everywhere, you get free drinks everywhere… it’s difficult to do anything but be super-involved in nightlife. Eventually, after I’d joined a band for a while, I decided I wanted to go back to school and learn more… I was making music but I wasn’t able to make the music I wanted to make. I looked at a sound studies program and I applied to that and I applied to a school in California called Mills College. It’s an amazing school, John Bishof, Maggie Paine, Fred Frith…all these really big names in experimental music teach there. Just to have access to them as mentors was life changing. I was also exposed to different kinds of technology, I was able to develop that side and I felt much more comfortable with a laptop as an instrument. How important is the music academic thing? You seem very much into sounds and programs. The reason I want to study at Stamford is because I think they’re really at the forefront of tool development, it’s not like this academic thing where they’re just doing arcane things that don’t apply; they’re working with Dolby and with an industry and writing very complex algorithms and trying to push what’s possible with computer music forward. I don’t think I could get access to that on my own, so being invited in and being shown these processes is really exciting an important to me. I really want to take the technical skills that I have right now to the next level. When I was applying some of the areas of interest obviously processing, signal processing, specifically voice, also performance systems and another area is network performance. Performing over the network. Being able to be in multiple cities at the same time and performing with other people in multiple cities at the same time. But during your Berlin time there wasn’t any releases? I did some stuff but I didn’t feel comfortable with anything, I didn’t feel that I had found my voice. I’m very hypercritical of my own work and I knew it wasn’t there yet. I took some classes with Lauren Newton at one of the big institutions here. I was going out and trying to figure out what I wanted to do. I started taking contra bass lessons, which is insane because I didn’t want to do that, but I was desperately searching for my voice so I felt I needed this classical instrument to help me find XYZ. Going through that process made me figure out that I didn’t need that. I think the album is a strange mish-mash because it shows all of my interests; there’s some dance tracks on there, there’s tracks that are purely experimental with no beats. I hope people are able to understand the thread that goes throughout the whole album. The album’s coming out on RVNG Intl; how did that come together? I actually sent Matt the demo and he just immediately got it. I sent it to a few people and he was the first and most enthusiastic to respond. It was the only label where I didn’t personally know someone there, so that was exciting for me. In terms of getting into music through the internet, through labels, we need these filters for exploring releases. A year ago I would have said labels are dead and that all you needed was a good blog and then someone will find you. But now I feel that we need these filters for exploring interesting music. Absolutely, I think my Car release is much more experimental than the album. I don’t know how many people have heard it, maybe a couple of hundred, but I hope this album we be heard by many more people. I’m not interested in playing to five people in a basement, I want to reach a broader audience. I’m always curious to know, especially with electronic and experimental artists: are you looking forward to touring? Are you scared? What’s the show about? Everything from my album was written over a period of time for live performance. So I would write something for a show, see how that would go, then restructure it and move it around and it would be better for the next show. Everything that I do is from live performance. I don’t write six tracks and figure out how to play it live, I know how it’s going to happen. A lot of the research that I did on my Masters program was about embodied electronic music performance. It’s this really big issue right now; what does it mean to be a laptop performer? Is it engaging enough? I personally think it is, but it’s about finding new paradigms in which to situate that. You can have a really engaging violinist or you can have a really disengaging violinist, and the same applies to a laptop performer. I think we’re still figuring it out as a genre. A lot of my work is about not apologizing for using a laptop, really trying to bring what the laptop can do and what other instruments can’t do. It’s the most intimate instrument you can have, you can have a conversation with your boyfriend on Skype or you can find out your grandmother died on email – all of your life is happening there. So can we tap into it and not see it as a statement we need to hide. Some people are putting their laptop under the table and then having their midi-synced instruments on the table to pretend the laptop isn’t there. Let’s just figure out a way to make it this engaging, embodying thing instead of trying to constantly apologize for it.